Because it's low in calories, fat, and sugar but high in protein and fiber, oat milk is a great milk substitute if you're trying to shed a few pounds. You’re probably familiar with popular non-dairy milk alternatives like soy, almond, cashew, and coconut milk, but recently, oat milk has become the darling of those who eschew dairy in their diets. Seriously folks, if you’re on a plant-based diet and haven’t tried oat milk, you’ve been missing out. It’s low in fat and also lactose-free, which is perfect for anyone who is lactose intolerant or simply chooses to go light on the dairy when it comes to their eating habits. Most importantly, this healthy milk alternative is utterly delicious, with a delectable creaminess that will satisfy anyone who misses the texture of full-fat milk. Oat milk is made by soaking steel cut oats in water, blending them until smooth, then pouring the blended oat mix through a cheesecloth to strain out the solids. It’s so simple to make you can even make it at home. The result is a delicately flavored, mildly sweet, thick non-dairy milk which you can enjoy in your morning cup of coffee, protein smoothies, your favorite creamy soups or pasta sauces, or a cup of hot cocoa when you’re feeling cozy. You can treat oat milk the same way you’d treat any other milk – dairy or not. How to make oat milk at home? As we mentioned, it’s super easy to do. Simply soak one cup of oats in water for about half an hour to an hour. Drain the oats then add three to four cups of water and blend. Take a cheesecloth and strain out the oats and voila! You have a freshly made batch of oat milk for your every need. Where to find oat milk? If you have a busy lifestyle and making oat milk isn’t a viable option for you, most supermarkets (from Whole Foods to Safeway and everything in between) now stock dairy milk alternatives, oat milk included. Naturally, your local health food market will carry a selection of oat milk as well. If you’re looking for recommendations, some of our favorite brands are Oatly, Rude Health Oat Milk, and Umpqua Oat Milk. Why is oat milk so good? Here are some of the benefits of drinking oat milk. Each cup contains a whole host of vitamins and minerals, including vitamins A, B12, D, iron, and important macronutrients like fiber and protein. Oat milk comfortably beats other non-dairy options like nut milk and coconut milk, although if you’re looking for an extra protein boost, soy milk does trump oat milk in that department. Believe it or not, oat milk actually contains more bone-strengthening calcium than cow’s milk and virtually no fat in comparison: a mere 2.5 grams per cup versus 8 grams in cow’s milk and zero cholesterol. 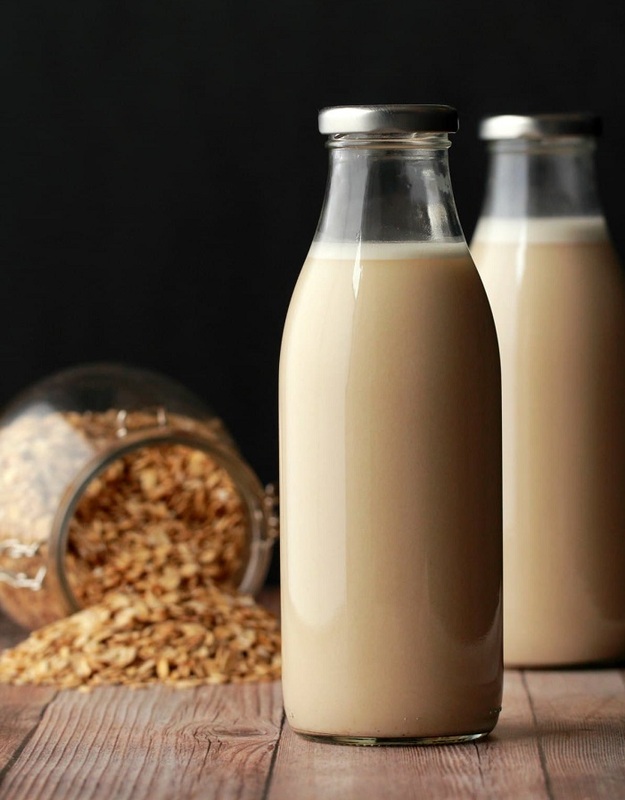 Because it’s low in calories (130 per cup), fat, and sugar but high in protein and has fiber, oat milk is a great milk substitute if you’re trying to shed a few pounds. It’s an ideal solution for anyone out there who is lactose intolerant, has nut allergies or is concerned about hormone use in dairy milk. When it comes to dairy milk alternatives it’s important to take a look at the ingredients. Some oat milk brands may contain more than just oats and water. Oils, gums, sweeteners, and flavorings may crop up in some of the options available in store, so if you’re wary of what you’re putting into your body, it’s worth checking out the back label before you buy. Another important consideration for anyone who adheres to a gluten-free diet is that while oats don’t contain gluten, there is always the possibility of cross-contamination in a company’s facility, especially if other products based on wheat, barley, or other grains are processed in these facilities. Again, check the label for confirmation. Pro-tip for our gluten-free friends out there: Oatly’s oat milk is made from 100 percent gluten-free oats and contains less than 100 ppm of gluten in its products. Drinking oat milk in conjunction with proper exercise and diet can help with weight loss and ensuring you meet your nutritional needs. As a low-fat alternative with plenty of nutrients and satisfying flavor, oat milk should definitely be a top contender for shelf space in your refrigerator.